It's been three weeks back at work and it feels like three months. I think I'm also wishing for spring and warmer weather. I'm noticing that I'm really craving meals with fresh ingredients like the Chickpea Salad and the Zesty Bean Salad I made last week. I've also noticed I've been pinning more ideas for gardening. What about you? Are you wishing for warmer weather? This drink would be perfect on a warm summer afternoon and I plan on making it again. 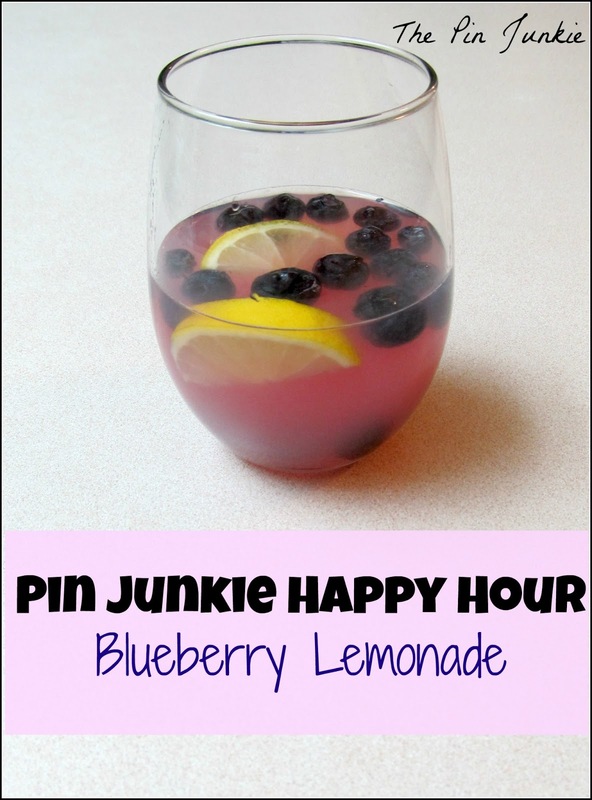 It's spiked blueberry lemonade and the recipe is from Veggie Belly. This is a simple cocktail to make and you could easily make a big pitcher for a party. Its just lemon juice, sugar and water to make lemonade. When you add the blueberries, it makes the drink turn a real pretty pink. My husband enjoys participaing in the Friday night Pin Junkie happy hour as well. He commented on the pink, girly frou-frou color of the drink and the fruit in it and said he would never drink this in public. I think he liked it though, since he finished it off pretty quick. If you need a girly pink drink or if you need a reminder that warmer weather is just around the corner, here's the recipe for spiked blueberry lemonade. Enjoy and happy weekend! Place all ingredients in a pitcher and stir till sugar dissolves. Muddle the blueberries a little using the back of a wooden spoon to release their juices and color. Taste and adjust sugar if needed. Serve chilled. Looks really good! I am ready for happy hour today! Have a great weekend! Following now from the Grow Your Blog Hop! Glad you're here! We'll be having another happy hour next Friday. Hope you can make it and thanks for following! Reminders that summer are coming are always good! visiting today from the Harvest of Friends hop.